Shamanism in the Sakha Republic (Yakutia) of the Russian Federation recently has come out of hiding after Soviet repression, and into fashion. Images of the shaman are changing in villages where traditional healers maintained their practices in difficult conditions and in cities where a resurgence of spirit belief and healing has led to the founding of an Association of Folk Medicine. Shamans and folk healers manipulate their own images, and in turn are changed by the upheavals of politicized cultural revitalization. In this complex and interactive context, folklore about traditional shamans has become especially rich and accessible. Analysis of the link between shamanism and ethnic identity derives from historical research and frequent field trips from 1986-1995. The phenomenon studied in this paper’ritual possession among Ladakhis and among Tibetans in Nepal’may originally have little to do with Buddhism. Now, however, it is more or less an integrated part of Buddhist practice and the activities of the spirit-medium are placed in a Buddhist scale of virtues. As a further interesting, but, perhaps, compelling, feature in the mediumistic séances, allusions are made to Gesar and the heroes of the epic. In séances both with Tibetan and Ladakhi spirit-mediums the epic plays a small but crucial part. Thus, there is an interaction between shamanism, Buddhism and folk culture. Women shamans ensure the cohesion of the Nung in the Jingxi region (Southern province of Guangxi, China). Thanks to their paq, the shamans’ elector-spirit and primary spirit-ally, the shamans have been able to survive through all political crisis. Shamans have two forms of election, passive and active. ‘Passive’ elections reveals itself in the form of disturbances caused by a paq. ‘Active’ election is accomplished by means of the soul of a dead child. It is understood that this paq is the soul of a dead child dwelling in the Flower-Garden. The semantic field of the term paq allows us to define him as the Flower-Soul of a dead child living in the Flower-Garden. The Flower seems a fundamental metaphor belonging to the cultural area of South China (Fujian, Guangdong and Guangxi provinces) occupied by different populations. Women’s storytelling, shamanic, and artistic traditions in the Amur River region are better preserved than men’s. Today most Amur shamans are elderly women, who survived war and repression. Men’s traditions were more disrupted by the Soviet system. So far there are no young shamans, who must be selected by spirits, have shaman ancestors, and undergo an initiatory illness. Stories and legends follow every stage of the shaman’s life. Heroines often live alone, undergo an initiation, or marry an animal. Another constant female image is the wise old woman. These strong images empower women today. Shamanic traditions are alive in the Amur and much needed. Japanese immigrants went to Hawaii en masse between 1885 and 1924 to work on the plantations, and soon established themselves as successful coffee growers. They needed fortune-tellers to set the most appropriate time for harvest, and turned to the kaulas, the Hawaiian diviners, who played a role analogous in many ways to that of the miko in Japan. The paper discusses how the Japanese tradition mixed with local, Hawaiian ways of divination. Does shamanic journeying and drumming have associated psychological and immunological responses? The State-Trait Anxiety Inventory, Schlosser’s Well-being Scale-22 and Impact of Life Scale, and the Profile of Mood States were used to evaluate anxiety, well-being, stress, and mood disturbance. Subjects were 40 healthy male and female experienced practitioners from 30 to 60 years of age. Repeated Measures Analysis of Variance revealed that, compared with baseline, the shamanic journeying and drumming condition was associated with increased physical well-being (p < .001), increased affective well-being (p < .01), and increased total well-being (p < .01). Anxiety (p < .001), anger (p < .001), confusion (p < .001), depression (p < .001), fatigue (p < .001), tension-anxiety (p < .001), total mood disturbance (p < .001), and stress (p < .001) were significantly lower after journeying with drumming than at baseline. Comparison of overall group means revealed no significant difference in concentration of salivary immunoglobulin A (S-IgA) from baseline to post-treatment. However, when the data were analyzed by level of S-IgA response, there were distinct profiles of associated psychological descriptors for each. There was also a significant correlation between S-IgA after the drumming/ journeying condition and positive-constructive imagery style. These findings suggest (1) that certain psychological features may differentially influence immune response and (2) that positive psychological effects of shamanic journeying are associated with drumming specifically with respect to stress, anxiety, well-being, and mood disturbance. Shamanism has been one of the most significant elements of the spiritual tradition among the Altaic peoples. It can be seen as a treasure house of folk knowledge especially among the nomadic and hunting keepers of tradition such as healers, spiritual leaders of the community, fortune-tellers, soothsayers, who were able to predict the weather, the singers of heroic epics, historical songs and myths, shamanic hymns and prayers, good actors and musicians. 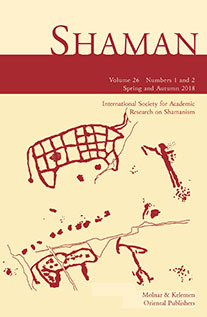 In the paper, the author gives an overview of the new trends of the studies concerning Altaic shamanism. Recently a great number of publications have been appealing, especially in Russia, and there is a contemporary revival of shamanism among the small ethnic groups of Siberia. The Bashkirs, a Turkic-speaking people living in the region of the Southern Ural Mountains believe in four kinds of souls (yän ‘life-soul, isem ‘name-soul’, kot ‘fortune-soul’ and tin ‘breath-soul’). The paper discusses the Bashkir concepts connected with the life-soul, the name-soul and the fortune-soul in details. A tale told in some Korean shaman rites fancifully celebrates human conception as a comic farce and birth as a sacred wonder overseen by the Sakyamuni Grandmother Spirit of Fertility. A symbolic ritual playlet praying for a child’s health in other rites honors this trusted Spirit, but only after summoning another, fearful Grandmother Spirit, who snatches away children to death. A one-man medley of farcical folk skits presented in still another rite portrays the wonder of birth, but in some versions arouses shocked amazement as the infant abruptly takes sick and dies. Realism tempers wonder; and in all three rites, the shaman shows her skill in storytelling and dramatic play, not in entering an ecstatic trance. Theatrical arts have frequently been a part of shamanic funeral rites in Korea. The Tashiraegi of Chindo Island is an excellent example of a Korean theatrical funeral rite. The performing context of Tashiraegi is closely related to shamanism. The performers came predominantly from the ranks of shamans and were contracted through the shaman guild at the request of the bereaved family. Furthermore, the ultimate aim of the performance was the consolation of the dead’i.e. it was a kind of offering to the dead person. The content of Tashiraegi is also difficult to separate precisely from that of shamanic funeral rites. In short, Tashiraegi meant something more than entertainment in that; it contained wishes of magical efficacy. Although Tashiraegi lost its efficacious purpose as it developed, it never separated itself from its ritualistic ur-origin in the shamanic psychological healer tradition. For the Hmong shaman, healing is a very elaborate rite. However, it is an activity confined to saving life or restoring health; the shaman does not cross over into the realm of death. Nor does he, in his capacity as a shaman, take part in the funerary rites. To investigate his patient’s symptoms and work out of a diagnosis, the Hmong shaman makes use of a special set of conceptual tools. On closer analysis, it is obvious that all these tools facilitate inquiry in one of three distinct directions: 1. the patient’s own vital mechanisms, 2. the spiritual third parties involved as the direct or indirect cause of illness, and 3. his own power and ability to identify and master his patient’s condition. Although expressed in the form of metaphors, the underlying assumptions are both pragmatic and functional. This, perhaps, is the reason why’the trance and his altered state of consciousness notwithstanding’the shaman’s actions always follow an impeccable logic. His failure does not imply some shortcoming in the system to which all subscribe; it only means that he was not powerful enough in the use of it. Accordingly, the patient or his family will call in another shaman in the hope of better results. There is no lack of shamans in a traditional Hmong village, and all are, in theory, considered to be equally competent. A handful of them, however, may be more popular, because of their higher rate of success. But there exists no competition or open rivalry between them because they all derive their knowledge from an initiatory tradition in which masters teach their disciplines step by step; consequently, each and every one of them is very well aware of how long it takes to be trained in this art, which is none other than the power of healing. The Ladakhi shaman’s dialogue with his patient and his healing procedure is analyzed in detail. The analysis shows the role that the shaman’s healing ritual has in concretizing traditional etiology. The sÃ©ance is the place where the shaman can actualize the suspicions, anxieties and fears of the patient, where these are shared by those present, and from which the patient emerges feeling quite himself, thanks to the outpouring of fellow feeling, and to his firm belief in the power of the supernatural. In the changing circumstances of contemporary Ladakh, the shamanic sÃ©ance also functions as a means of reproducing folk etiology.